Bees perform a vital role in the pollination of fruit, vegetables and flowers. Looking after them will give you a greater understanding of the intricate system of plants and insects which exists all around us, and how that life is affected by the seasons, and by the changes that we make to our environment. Beekeeping is a sociable and rewarding hobby which can be enjoyed at various levels. Many people have just a few hives in their garden or on a neighbour’s land, but others go further and keep dozens of hives producing large amounts of honey. Although you do not need any specific skills to keep bees, it is not an occupation for those in a hurry! One of the attractions is that beekeeping is a peaceful hobby, and you need patience and attention to detail in order to get it right. Beekeeping is a fascinating craft and WBKA actively encourage new beekeepers. We run Taster Sessions for people wanting to take up beekeeping but have never experienced an open hive. This will give you an opportunity to understand what is involved in beekeeping, the work of the beekeeper and importantly meet the bees. The sessions will be run by one of our friendly experienced members who will be happy to show you around their apiary. Taster Sessions will be run according to demand but generally from March to September. If you would like to register for a Taster Session then please get in touch with one of the local associations. Once you have decided to keep bees the first step is some initial training. At WBKA we run an introduction to beekeeping course starting in March which includes both theory and practical training and we encourage all to book well in advance as this course is proving very popular. See our training pages for more information. Your biggest purchase will be the hive. 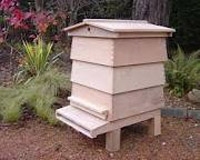 The modern hive, with its replaceable frames, is a recent invention, perfected by Langstroth in the mid 19th century. Key to its success is that it largely avoids damaging the colony when honey is removed. It comes in many forms starting with the most basic and very common British National to the Langstroth and the traditional peak roofed one that we all associate with beehives, the WBC (named after its designer, William Braughton Carr). Many beekeepers use the National type, and starting with that type is probably a good idea. After you have some experience with one or two hives you might want to try another design. A full bee suit gives total protection, though some beekeepers use just a jacket and veil. Wellington boots are fine. Gloves will get sticky from the propolis in the hive, and could transfer disease from one colony to another, so thin disposable gloves are best. Leather gloves can retain bee stings, which will annoy the bees, and also disease, so are not recommended these days. For all clothing, it is vital to have overlaps to stop the bees entering your clothes as they walk upwards. Suppliers of clothing are listed on our Links page. The smoker is used to keep bees away from the part of the hive you are working on. It burns slowly and produces cool smoke which will not harm the bees. When they encounter smoke their instinct is to go to their honey stores and feed, which in the wild would be their way of dealing with a fire which might threaten the colony. The hive tool is used to separate the parts of the hive when opening it and to free the frames before removing them. A tool is needed because the bees seal small gaps in the hive with propolis, which is essentially a resin glue. During the early spring and autumn you will need to feed your bees, so you will need a sugar syrup feeder. When clearing the bees before removing honey, you will need a bee escape (a one way valve for bees). For handling and marking queen bees you will need a queen cage and a marking pen. 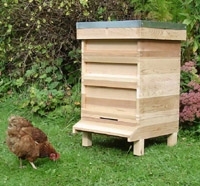 A self-assembly National hive will cost about £125. Fully assembled hives obviously cost more. The price of a nucleus of bees (on about 5 frames) varies from year to year according to supply and demand. The price in 2012 is expected to be well over £100. The best price will probably be from your local association. A new bee suit with veil will be between £60 and £100. A new smoker will cost £20 to £40. Disposable latex gloves cost around £6 per hundred. It is possible to get complete beekeeping starter kits for £250 upwards, which include the hive, protective clothing, smoker, beekeeping book and often other useful gadgets. If you are a beginner do get advice before buying any second-hand equipment. It is vital to make sure that hive parts do not carry any diseases which could be passed on to your bees. The most expensive piece of equipment which beekeepers use is a honey extractor, and these start at around £175. Most associations have arrangements for members to borrow or hire honey extraction equipment. Beekeeping is a seasonal hobby, so the time needed varies over the year.In the middle of winter there is practically nothing to do, except to occasionally check for physical damage or snow blocking the entrances. The busiest time is the early summer when each hive should be checked weekly to stop swarming and add supers. The work in your first year will depend on exactly when you get your bees and how prolific they are.